Webcomics have provided a fertile training ground for neophyte cartoonists. Over the years, I've watched a number of artists go from toddling sketchers to masterfully sequential art storytellers. So it's only natural that professors would look to webcomics as a training tool for students interested in careers in cartooning. That's what makes Ultrasylvania such an intriguing project. Students in the Comic Collaborative class at the Academy of Art University take turns illustrating this alternate universe tale of familiar horror characters, in which Dracula, Frankenstein's monster, and a certain ancient Egyptian rule their corners of the world amidst political intrigue, espionage, and questionable romantic interludes. Co-creators Jeremy Saliba and Brian Schirmer are the art director and writer of Ultrasylvania respectively. The early pages of the comic tell the alternating stories of Dracula and Frankenstein's monster (who has styled himself as Victor Frankenstein). These monsters do not reside in the dark, but instead openly reign as the supernatural leaders of their own nations, incurring the fear and respect of their citizens. Dracula has invited the Englishman Jonathan Harker to write his biography, giving the foreigner unprecedented access to the histories and horrors of Castle Dracula. Harker has brought with him a young woman, Mina Murray, whom he claims is his fiancee. But it quickly becomes clear that Murray's reasons for visiting the vampire go far beyond keeping Mr. Harker company. Fifty years earlier, an injured woman named Ileana is brought to Castle Frankenstein, claiming that she watched Dracula slaughter her entire village. Frankenstein freely grants her his protection, and her story of Dracula encroaching into his territory encourages him to make his preparations for war. But is he overly swayed by his growing affections of Ileana? And what, even further in the past, did Napoleon's forces uncover in Egypt? Ultrasylvania is an educational project, with different artists taking on the comic for a few pages at a time before turning it over to a classmate. The story (if you can keep track of the dates) is clear enough that these shifts in style aren't overly jarring, but there are some artists whose work proves a better match for Schirmer's tale. Richard Healy's dark and bleeding watercolors capture the mood of Castle Dracula, and neatly set up the mysteries both of Dracula's past and Mina Murray's true intentions. Jonathan Aguillon's clear black lines and unnatural color palette, meanwhile, are perfect for the less moody and more narrative plot of Frankenstein and Ileana. And Valerio Fabbretti's detailed realism adds an exciting touch of terror to the opening page, and makes me eager to see the story return to Egypt. 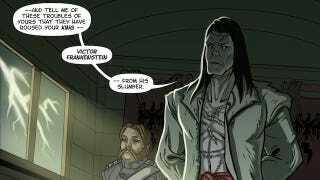 If you're won over by Ultrasylvania, the group currently has a Kickstarter campaign running to print the first 75 pages. The Kickstarter page also teases some of the upcoming pages and artwork, which promises more of this monstrous history of Europe, along with some possibly violent clashes between its supernatural heads of state.